Tech & Learning's Tech Forum Boston will take place at the Boston Marriott Newton in Newton, MA on Friday, April 26, 2013. We have arranged for preferred hotel rates for conference attendees. When making reservations, simply mention that you are attending Tech Forum Boston for a special room rate of $199.00 including complimentary high-speed Internet (single or double occupancy) plus applicable tax per night. Deadline: April 10, 2013. Under Group Code, enter TFBTFBA and click Check Availability. Note: the Tech Forum Boston discounted rate is available online only by entering the group code under Special Rates & Awards. Once the Tech Forum Boston group page appears, simply follow the prompts to finalize your discounted online room reservation. 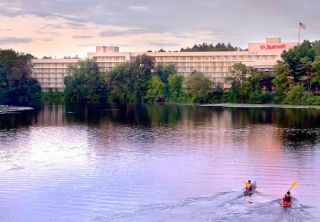 Situated on 22 acres of scenic riverfront land along the Charles River the Boston Marriott Newton is conveniently positioned near Boston College, Brandeis, Bentley, the high-tech beltway and the historic sites of Boston. With a central location on I-90 and I-95 and proximity to Logan Airport, the hotel is easily accessible. The hotel provides 430 luxurious hotel rooms, many of which offer beautiful river views. Boasting fabulous food, an indoor pool, over 20,000 sq ft of flexible meeting space and other luxurious amenities, the Boston Marriott Newton is an ideal venue for business meetings, conferences and more. Parking: Tech Forum Boston participants are entitled to complimentary self-parking onsite.